Before we proceed with power testing, substitute the dummy load with a 200 watts, 8 ohms resistor. With the probes of the THD analyzer connected across the load, spot frequencies of 200Hz, 1KHz, 10KHz and 20KHz are used to test the amplifier's THD at 1Watt, 60Watts and it's rated output of 125Watts. You should be able to record similar readings as in Fig 5. It is recommended that the power heatsink and dummy load be suitably cooled to avoid overheating. For 4 ohms testing, replace load with a 400 watts resistor. 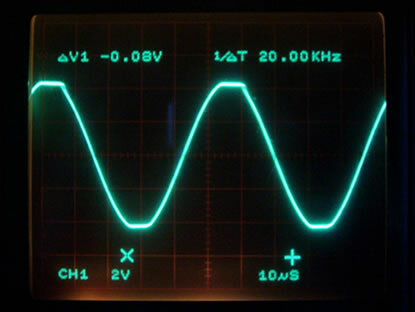 Note that as you gradually increase the output to maximum level, the output waveform should not exhibit any signs of distortion until clip. 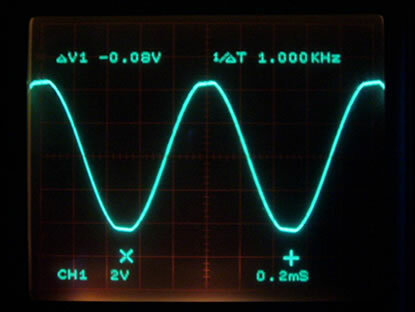 In Fig 6,7 and 8, the c200 is driven to 1% THD into 8 ohms to determine the waveform at clip. Note the symmetrical clipping at the three spot frequencies. 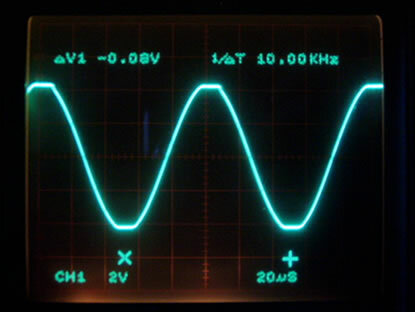 With a 4 ohms resistive load, similar results were observed. The PSU (Fig 9) is a conventional, unregulated supply. Input fuse F1 is for safety. Mains switch SW1, has its contacts straddled by a 4700pF X2 capacitor to suppress "popping" during switch-on. T1 is the power transformer with a secondary output of 40-0-40Vac. BR1 is the bridge rectifier and C2,C3 are the filter capacitors for DC smoothing. For monoblock, C2,C3 = 10,000uF x2/63V minimum. Transformer secondary should be rated for 250VA. For stereo, C2,C3 = 22,000uF x2/63V minimum. Transformer should be upgraded to 500VA. Supply rails (Vs) are +-53Vdc.